What can I expect from a stone floor restoration estimate? The exact details of any estimate will depend on the kind of stone you have, the location and the traffic conditions. 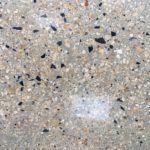 However any stone restoration estimate should be in writing and give a clear statement of the state of your floor, a clear explanation of the work needed to restore your floor to the desired condition and a fixed price for the work. Why should I restore my stone floor? There are several reasons. Amongst the more common reasons are: maintain an attractive appearance, protect the significant investment in your stone floor, a healthier living environment, avoiding further damage to your property, increased property value and peace of mind. How long does the average job take? The majority of our domestic work can be completed in one or two days. However, as we are a full-service stone floor restoration contractor, there are some larger scale jobs that may take many days to complete. In every case, our estimate will clarify the expected completion time. What is the average cost to restore a stone floor? It really depends on the work we need to do. Our estimates are free of charge for this very reason. We have the training and experience to recommend the most practical and economical solution for your particular situation. In general, smaller jobs may only be a few hundred pounds; larger scale jobs can be several thousand pounds. I am selling my house. Should I restore my stone floor before I sell it? A beautiful stone floor will help you maximise the value of your house. Prospective purchasers may be concerned at the cost of restoring and maintaining a stone floor, especially if they have little or no experience in looking after stone flooring. Do you do restore small stone floors? We restore all sizes of stone floor. Small stone floors, especially those in bathrooms, shower areas and bathrooms often need more hand work because they are too small for heavy stone machinery. Polished concrete flooring was first introduced in the industrial environment due to its ability to reflect light & incredible durability and resistance. 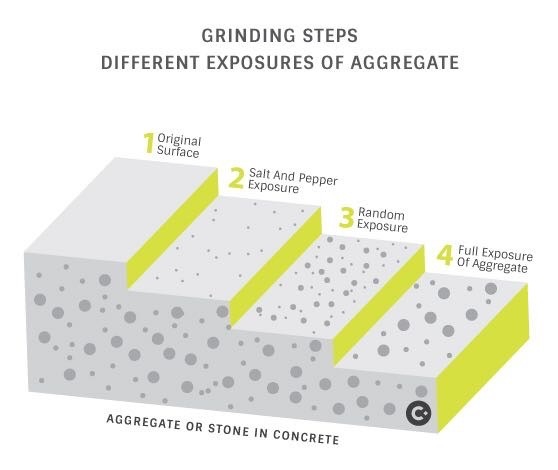 The process involves the removal of the top layer (concrete cream) to expose the aggregate. Once enough material has been removed the concrete polishing process starts with course honing. Working right through to the polishing stage to give the depth & clarity of shine. Longest-Lasting Flooring option Available:- A professionally polished concrete floor is the most durable, long lasting flooring option available. We do not add a synthetic topping to the concrete to ensure we expose the raw beauty of the concrete floor delivering a lively a shine. 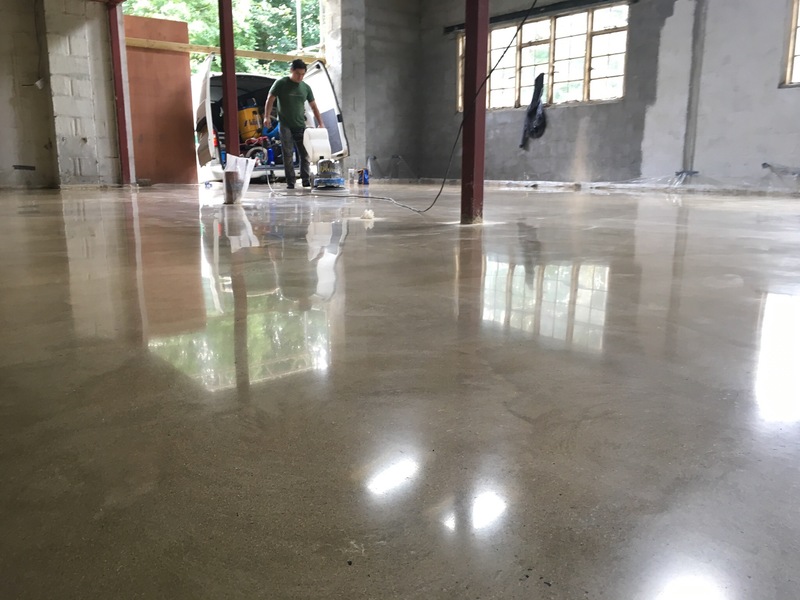 We recommend that polished concrete flooring is refurbished every 3-4 years to ensure a consistent shine, a re-polish can be done at a fraction of the cost of any other floor system. 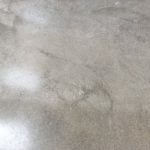 Meaning polished concrete flooring will outlast just about any other flooring in a domestic or commercial environment. Increased ambient lighting:- The natural shine of the floor gives enhanced beauty & acts as a natural, even light source – this reduces the requirement for artificial lighting. Higher levels of co-efficient of friction:- ( Slip reduction) Polished concrete flooring surfaces meet and most often exceed, OSHA standards, when wet or dry. When a concrete floor is polished, it can look like a layer of glass or water has been placed over the top. 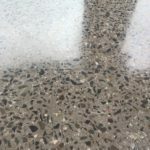 Its friction co-efficient is higher than ordinary concrete, meaning that you are much less likely to slip on a polished concrete floor making it ideal for commercial use. Decrease in floor maintenance:- The polished surface provides less drag on cleaning equipment; making brushes, pads and mops last longer. The polished surface is known as a Belby layer & is tightly compacted so much so it can repel oil, grease, paint and other spills & contaminants. 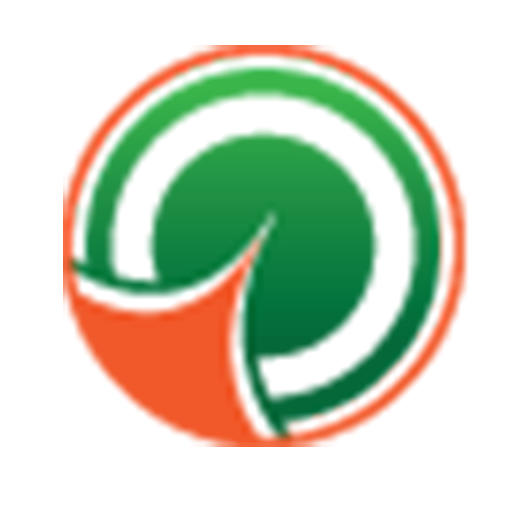 This makes a cleaning and maintenance schedules less demanding saving time and money. An economical option:- After the instillation cost a polished concrete floor is one of the most economical & cost effective flooring solution for most situations. 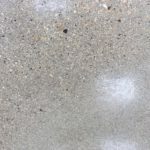 The decrease in costs associated with cleaning & maintenance polished concrete floors save hundreds if not thousands of pounds each year, not to mention that there is no need for regular professional overhauls due to the long-last durability. Polished concrete is a budget sensible, as well as beautiful, flooring system. No Need for Stripping and Waxing:- A polished concrete floor does not require regular sealing, waxing or stripping. The stronger natural polished surface will continue to look good with minimal intervention for years to come. 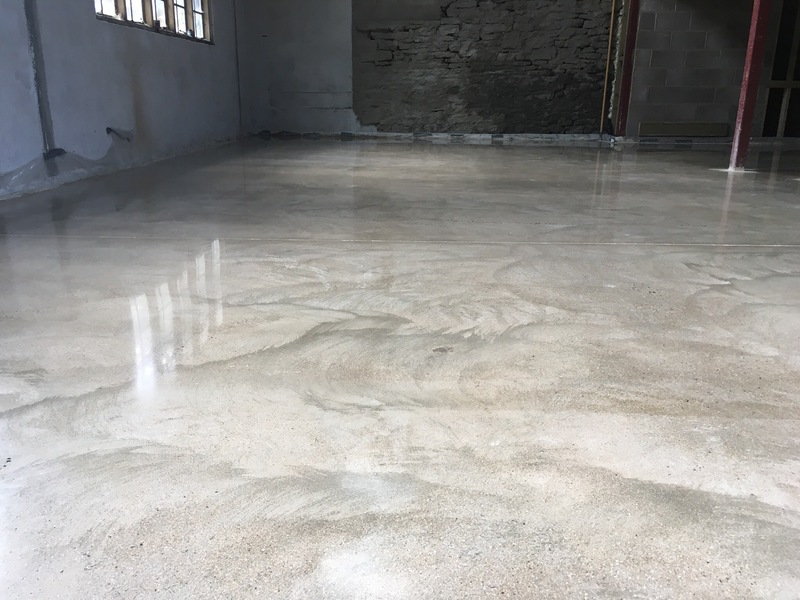 Desirability & Beauty:- A polished concrete floor is very highly regarded due to the appearance & practicality within any environment from warehouse floors through to modern kitchen floors. With a choice in colours and design, polished concrete flooring has quickly become a common site across hotels, airports, warehouses and new build houses. As previously mentioned the polished concrete is easy to clean and we can advise & supply the equipment you will require. All you need for the daily cleaning is specific stone cleaning solution. By following the recommended maintenance instructions you can make the cleaning easy & extend the floors life. Platinum produces the glossiest finish and is the concept we normally recommend to our customers. This is the most impressive option with high gloss results, perfect for a new floor in a modern home. It involves more grinding stages than the other concepts. The result is an unbeatably durable floor. The ballast or agrigate is exposed as with Gold & Platinum. Silver is therefore excellent if you want a floor with a matt or satin surface finish. Concrete floor surface is then sealed. The polished concrete floor surface is then sealed. We are regularly contracted to finish concrete aprons after installations. The durability & reduced maintenance of a polished concrete surface makes it the most economical & practical floor solution for high traffic commercial & industrial areas.